Femoroacetabular impingement (FAI) is a condition where the bones of the hip are abnormally shaped. Because they do not fit together perfectly, the hip bones rub against each other and cause damage to the joint. The hip is a ball-and-socket joint. The socket is formed by the acetabulum, which is part of the large pelvis bone. The ball is the femoral head, which is the upper end of the femur (thighbone). A slippery tissue called articular cartilage covers the surface of the ball and the socket. It creates a smooth, low friction surface that helps the bones glide easily across each other. The acetabulum is ringed by strong fibrocartilage called the labrum. The labrum forms a gasket around the socket, creating a tight seal and helping to provide stability to the joint. 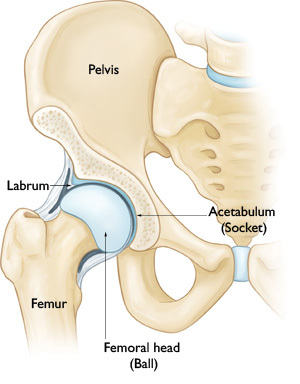 In a healthy hip, the femoral head fits perfectly into the acetabulum. In FAI, bone spurs develop around the femoral head and/or along the acetabulum. The bone overgrowth causes the hip bones to hit against each other, rather than to move smoothly. Over time, this can result in the tearing of the labrum and breakdown of articular cartilage (osteoarthritis). There are three types of FAI: pincer, cam, and combined impingement. Pincer. This type of impingement occurs because extra bone extends out over the normal rim of the acetabulum. The labrum can be crushed under the prominent rim of the acetabulum. Cam. In cam impingement the femoral head is not round and cannot rotate smoothly inside the acetabulum. A bump forms on the edge of the femoral head that grinds the cartilage inside the acetabulum. Combined. Combined impingement just means that both the pincer and cam types are present. (Left) Pincer impingement. 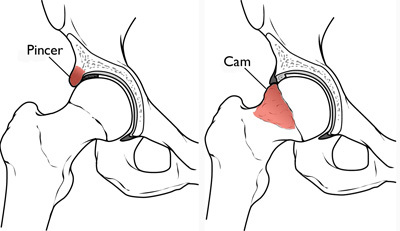 (Right) Cam impingement. It is not known how many people may have FAI. Some people may live long, active lives with FAI and never have problems. 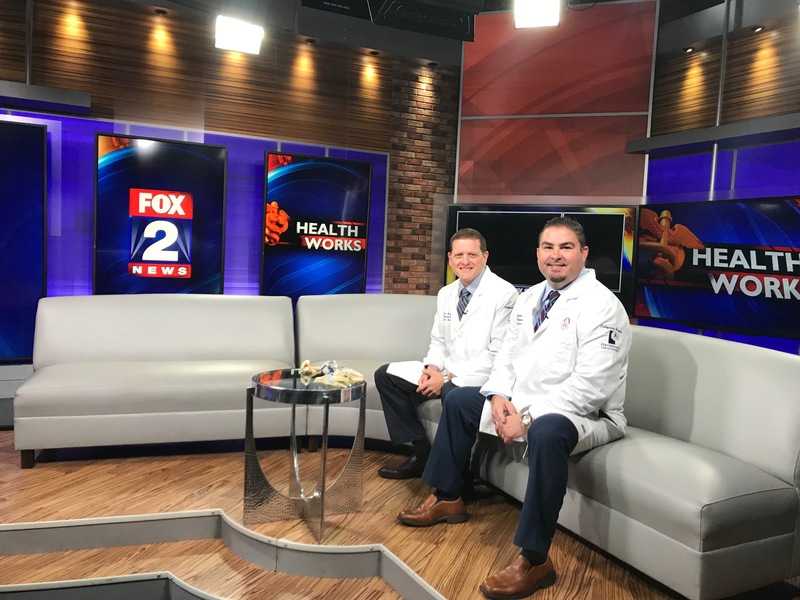 When symptoms develop, however, it usually indicates that there is damage to the cartilage or labrum and the disease is likely to progress. Symptoms may include pain, stiffness, and limping. FAI occurs because the hip bones do not form normally during the childhood growing years. It is the deformity of a cam bone spur, pincer bone spur, or both, that leads to joint damage and pain. When the hip bones are shaped abnormally, there is little that can be done to prevent FAI. Because athletically active people may work the hip joint more vigorously, they may begin to experience pain earlier than those who are less active. However, exercise does not cause FAI. People with FAI usually have pain in the groin area, although the pain sometimes may be more toward the outside of the hip. Sharp stabbing pain may occur with turning, twisting, and squatting, but sometimes, it is just a dull ache. When symptoms first occur, it is helpful to try and identify an activity or something you may have done that could have caused the pain. Sometimes, you can just back off on your activities, let your hip rest, and see if the pain will settle down. Over-the-counter anti-inflammatory medicines (ibuprofen, naproxen) may help. If your symptoms persist, you will need to see a doctor to determine the exact cause of your pain and provide treatment options. The longer painful symptoms go untreated, the more damage FAI can cause in the hip. During your first appointment, your doctor will discuss your general health and your hip symptoms. He or she will also examine your hip. As part of the physical examination, your doctor will likely conduct the impingement test. For this test, your doctor will bring your knee up towards your chest and then rotate it inward towards your opposite shoulder. If this recreates your hip pain, the test result is positive for impingement. Your doctor may order imaging tests to help determine whether you have FAI. X-rays. These provide good images of bone, and will show whether your hip has abnormally shaped bones of FAI. X-rays can also show signs of arthritis. Computed tomography (CT) scans. More detailed than a plain x-ray, CT scans help your doctor see the exact abnormal shape of your hip. Magnetic resonance imaging (MRI) scans. These studies can create better images of soft tissue. 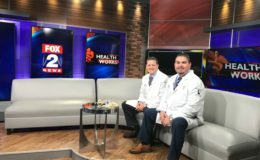 They will help your doctor find damage to the labrum and articular cartilage. Injecting dye into the joint during the MRI may make the damage show up more clearly. Your doctor may also inject a numbing medicine into the joint as a diagnostic test. If the numbing medicine provides temporary pain relief, it confirms that FAI is the problem. Activity changes. Your doctor may first recommend simply changing your daily routine and avoiding activities that cause symptoms. Non-steroidal anti-inflammatory medications. Drugs like ibuprofen can be provided in a prescription-strength form to help reduce pain and inflammation. Physical therapy. Specific exercises can improve the range of motion in your hip and strengthen the muscles that support the joint. This can relieve some stress on the injured labrum or cartilage. If tests show joint damage caused by FAI and your pain is not relieved by nonsurgical treatment, your doctor may recommend surgery. Many FAI problems can be treated with arthroscopic surgery. Arthroscopic procedures are done with small incisions and thin instruments. The surgeon uses a small camera, called an arthroscope, to view inside the hip. During arthroscopy, your doctor can repair or clean out any damage to the labrum and articular cartilage. He or she can correct the FAI by trimming the bony rim of the acetabulum and also shaving down the bump on the femoral head. Some severe cases may require an open operation with a larger incision to accomplish this. (Left) During arthroscopy, your surgeon inserts an arthroscope through a small incision about the size of a buttonhole. (Right) Other instruments are inserted through separate incisions to treat the problem. Surgery can successfully reduce symptoms caused by impingement. Correcting the impingement can prevent future damage to the hip joint. However, not all of the damage can be completely fixed by surgery, especially if treatment has been put off and the damage is severe. It is possible that more problems may develop in the future. While there is a small chance that surgery might not help, it is currently the best way to treat painful FAI. As the results of surgery improve, doctors will probably recommend earlier surgery for FAI. Surgical techniques continue to advance and in the future, computers may be used to help guide the surgeon in correcting and reshaping the hip.